When Jamie McAllan, a WWII fighter pilot, returns home to his family’s Mississippi Delta farm, he cannot leave the horrors of war behind. Ronsel Jackson also returns to the Mississippi delta to resume sharecropping with his family on the McAllan farm. A decorated war hero, Ronsel struggles as he must readjust to life in the Jim Crow South. Ronsel and Jamie become friends, and it is this friendship that lends an uneasy tension to the film. Jamie drinks too much, and Ronsel chafes at the rules that make him a second-class citizen. 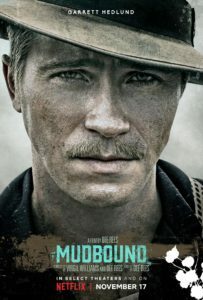 Superb acting and cinematography make Mudbound a challenging and enriching film to view. Based on novel Mudbound by Hillary Jordan. Watch on Netflix by checking out one of our rokus. This entry was posted in Mary K. and tagged drama, movie on March 30, 2018 by jamiea.